Let's talk about history! Join other history buffs to talk about Denmark Township. Do you have questions about Denmark Township History? DTHS can help. Bring objects or photos to share. 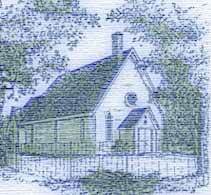 This event will be held in the historic Basswood Grove Guild Hall of St. Mary's Episcopal Church. Light refreshments will be served. Everyone is welcome at this free event. This entry was posted in Announcements and tagged event, history. Bookmark the permalink.